Everyday at Cityclean we get calls from residents about waste scattered along streets because sacks have been ripped open - even when left out for a short time. Making sure waste is properly contained is the best way to stop this from happening. Communal container systems have been in place in many heritage areas in Rome, Paris, Barcelona, Seville, and Verona. Here in the UK, communal containers are working well in Edinburgh, Aberdeen, Westminster and areas in Brighton & Hove (including conservation areas). In 2004 we carried out a trial with communal containers. 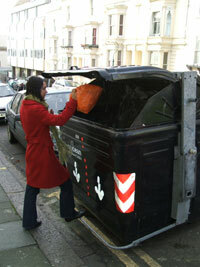 As part of the trial we placed the bins out in 24 streets in central parts of Brighton & Hove. Separate to the trial, communal bins have also been placed in other areas that have requested them. Based on the success of the trial and the results of the 2008 consultation, the scheme will be introduced in many central areas of the city next summer (2009). Residents of all affected areas were contacted directly and asked to comment on the idea of communal bins and on the locations being proposed. The consultation period ran from January 25 - February 24 2008. The consultation results were analysed by the council research team. There was a 29% response rate and the majority of affected residents were in favour of a communal bin scheme. The extension of the communal bin scheme was taken to Cabinet in September and was approved to be introduced in many central areas of the city. What do communal bins mean for me? Communal bins will be introcuced to help those people, in flats and bedsits who don't have enough space to store their waste, over a week, 24 hours a day, 7 days a week. You will no longer need to store waste inside your property or outside your front door until collection day or brave the basement bin store. Instead you will be able to put your rubbish into the communal bin whenever it's convenient for you. Communal bins wwill make your streets cleaner, there will be no food for seagulls and foxes and no ripped bags of waste strewn on the street. How will fly-tippers be controlled? The waste enforcement team will make sure action is taken against fly-tippers. Street cleansing crews will regularly check around the bins to make sure they are kept clean. Won't the containers always be overflowing? The containers will be emptied regularly to prevent them from overflowing. Where we currently have bins we do not have any problems. Paper & Cardboard / Glass & Cans / Plastic Bottles & Household Batteries. Some areas are part of the communal recycling trial scheme and can dispose of their recyclables in the same way. There are also recycling banks located around the city centre for a range of recyclable materials. 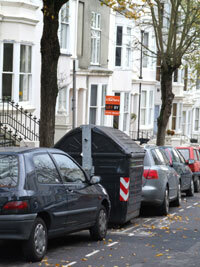 What impact will communal bins have on parking? Where possible communal bins have been sited on double yellow lines and on wide pavements to ensure loss of parking spaces is minimal. However, there are some areas that may lose parking spaces (see maps). All communal bin site proposals have been discussed with the highways department to ensure any road safety issues are addressed. How do I use the communal containers? The containers are easy to use. There is a foot pedal at the bottom of the bin, this requires a light push with your foot to open the lid. The bins are there for you to use as and when you need. We suggest you deposit a small bag at a time. If you feel you cannot take your waste to the communal containers we can help you, all you will need to do is contact us to arrange assistance. You can see communal bins working successfully in areas such as: Buckingham Road, Brunswick Place, Oriental Place, Montpelier Road and St James Street. See the communal street bin pages for more information about the existing scheme. The results of the consultation have now been analysed and the decision to extend the scheme to many central parts of the city was approved at Cabinet in September. The scheme will commence around summer 2009. Residents will be notified with more details nearer the time.